The French expression "A la bonne franquette" is typically used around food and entertaining. It is about preparing simple food without fuss and sharing a meal with friends and family. 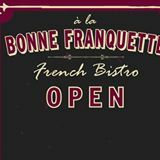 Use of the expression "A la bonne franquette" implies a breaking of the strict rules of entertaining A la francaise. Although the food at A la bonne Franquette bistro is prepared using traditional French techniques, Chef Hamed takes a number of liberties with his use of spices and flavors, influenced by his roots in Sudan and travels through Africa, Europe and the United States.